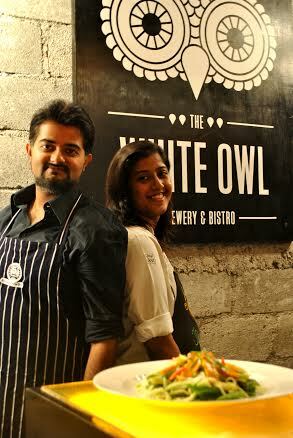 My last visit to White Owl had me raving about Chef Kshama Prabhu’s ravioli in hazelnut butter and its very refreshing home style ginger lemonade. I was there again last evening to experience their new initiative, ‘Culinary Collaborations’ where Kshama in its first edition has paired up with Nikhil Merchant a blogger and a nonchalant gourmand to create a supplementary menu showcasing local produce, local ingredients and more importantly the collective inspiration from both the personalities. 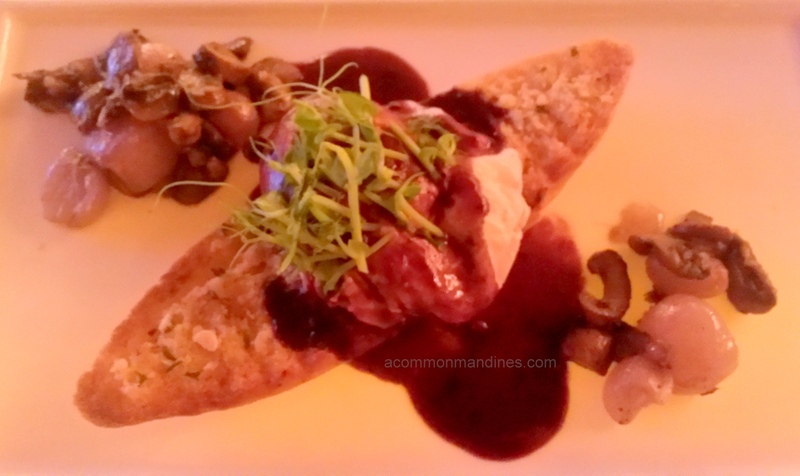 My last visit was a quiet lunch, talking business and this one was a boisterous dinner surrounded by football fanatics, metaphorically speaking they enjoyed every moment of the Germans doing a Port wine reduction. Nonetheless I managed to focus on my food seldom stealing glances from the corner of my eye. The Ginger lemonade to begin was refreshing got my palate ready for the journey. 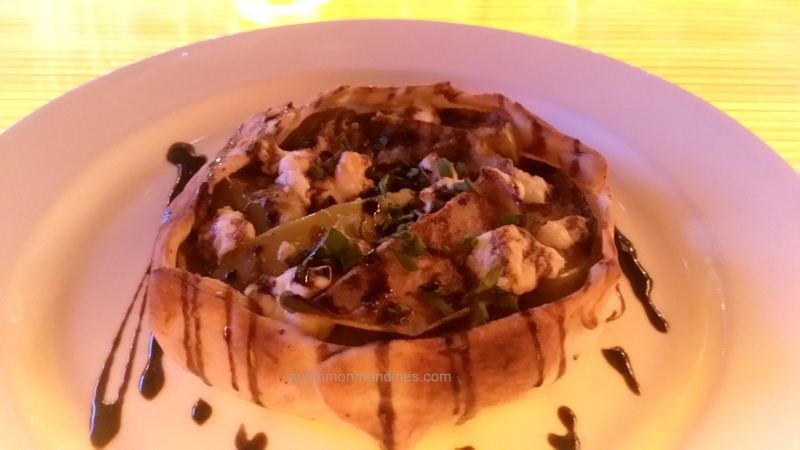 The Grilled Green Apple Galette with goat cheese and slow cooked onions on a biscuity crust was a fantastic in flavour. I would have loved a crumbly crust instead. The Oeuf en meurette (Egg preparation) on sharp garlic bread, sweet onions, soft mushrooms and the umami laden Meurette sauce with a poached egg on top was a good deal. Seems very breakfast, mid-morning like preparation but I did not care much. The Asian raw and ripe mango salad with Alphonso slices, not to sour raw mangoes and raw papaya gave it the crunch but the dressing of light soy and chilli failed to take the salad home. 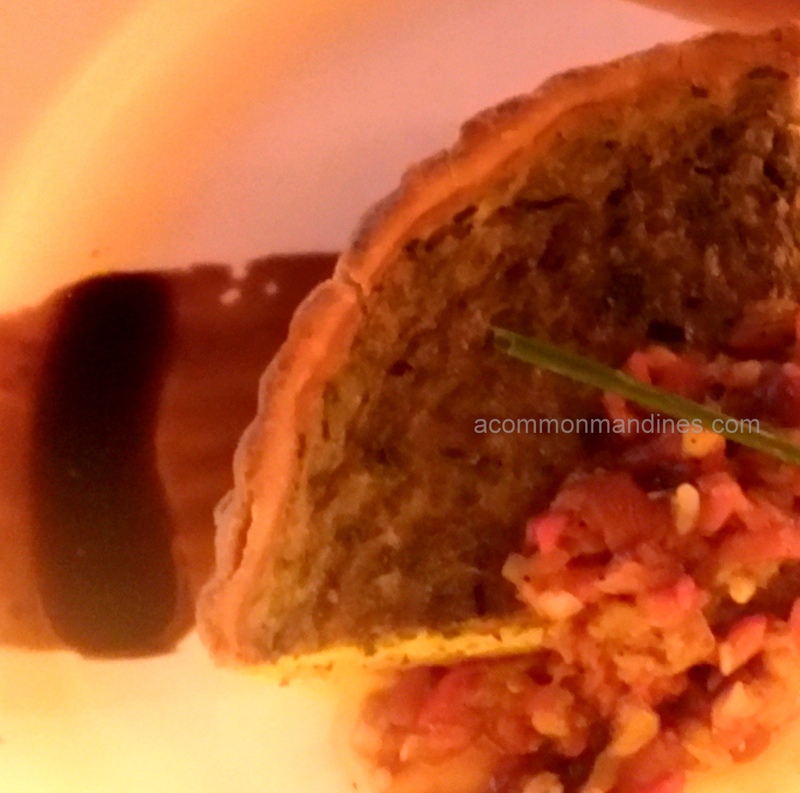 The herb and Blue cheese quiche was divine, extremely light and rich with a soft crust. The herbs came through and so did the cheese, piquant salsa and the sweet wine reduction accentuated the dish even more, was clearly the winner for me that evening. We ended with the fresh Alphonso crepes, the crepes came topped with slices of luscious sweet mangoes and custard but what spoiled the show was the mangoes stuffed inside the crepes, they were sour. They have a few more vegetarian options in small plates and the mains like Yam batons, Brioche Mac n Cheese, Pumpkin Gnocchi Casserole etc and for desserts you could also try the Fig Chocolate and Kaffir lime crème Mille Feuille. The edition 1 of culinary collaborations is on for another month. Go drop in to see some classic and some well thought of combinations. Sure they would have ironed out the small aforementioned kinks by the time this piece is out. This city needs more of such seasonal menus within existing establishments and this will get the Indian consumer who is usually rigid in her/his choices to experiment and improve the country’s foodscape. Have you tasted the new fruit in the Indian market? Phoenix Marketcity, Kurla a dining destination!!!! !